We offer a variety of Diving packages and Courses in Hurghada, from Introduction Diving and DSD, Snorkelling and Daily Diving packages. Scuba Diving has never been so easy and fun. Learn how to safely and confidently execute dives with our professional team of Scuba Diving instructors whilst enjoying the beautiful Hurghada marine life! This is the perfect choice for beginner divers or anyone who’s unsure about beginning professional courses. Dip your toe in the water and book your Introduction dives now! For our more experienced customers, we recommend our Daily Diving packages. No matter what diving qualification you have, there will always be a suitable diving spot for you. 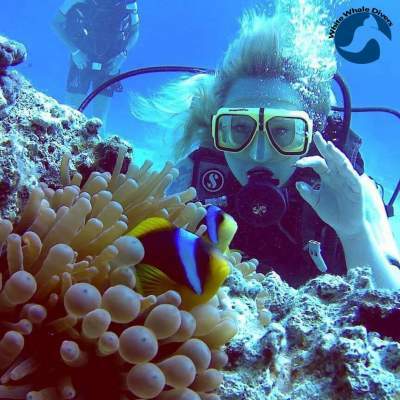 With over 40 different dive sites that we visit in the Hurghada reefs, you’ll never repeat the same dive. There is always something new to discover. Book one of our PADI professional Diving Courses and venture into the professional diving world. It takes only 4 days to The PADI Open Water Diving Course and become a part of the worldwide PADI Divers family. 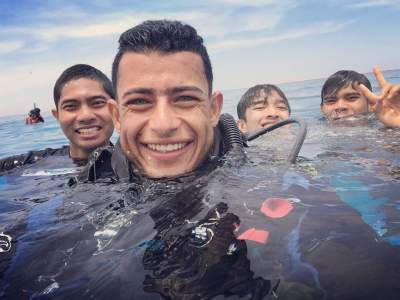 We are a team of experienced and professional divers based in Hurghada, who want to share our passion and love of the underwater world and specifically the Red Sea, with the rest of the world. 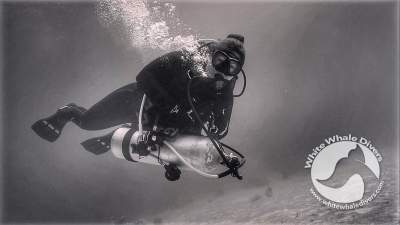 Yasser and Hedar, the owners of White Whale Divers, have been in the diving business for over 12 years, their priority is always the safety and comfort of our guests while innovating new ways to make you enjoy your experience in every way you can! Our first priority is always your safety; every single member of our crew is trained in EFR. Our boat is equipped with radios, a first-aid box, life vests and oxygen. Our equipment is all brand new and serviced regularly to ensure everything functions perfectly. Enjoy your trip aboard our two story MY White Whale. The first floor consists of two saloons, the captain’s room and a fully equipped kitchen where our talented chef prepares your lunch, fresh, daily. On the second floor you’ll find a beautiful sundeck where you can lay back and enjoy the sun on one of our comfy bean bags or relax in the shade under the roof on one of the many sofas. We pride ourselves on providing the best service and highest level of professionalism in our industry. From your transfer arrangements to preparing your lunch, guiding your learning or general help from our helpful crew, you can relax and let us take care of everything for you! We appreciate the beautiful environment of the Red Sea and want to preserve it. It is important that we don’t litter the water or touch anything underwater so that we don’t disturb the delicate ecosystem. Hurghada has become one of the most desirable diving destinations.With excellent weather year-round and a number of water activities available to you, you’ll never run out of things to do. Just in Hurghada, there are plenty of diving choices to suit everyone’s preferences such as accessible wrecks, caves and reefs that we can take you to explore.No matter where your interest lies, you’ll find what you’re looking for with us!